How can I license our Prism Central? It's running a Pro Trial license now. Insufficient licenses available to upgrade from your current license type of Starter. Manual registration results in the same error. We have an appliance Ultimate license for 7 nodes. I have not heard back from Dell so far but managed to fix the problem myself. First thing I did was enabling and disabling the Pro features one more time to see whether this would magically solve the issue but it did not. I then saw that there was still an outstanding alert for the license violations which I resolved. I've not seen the violation message since then and ncc health check is now also showing that the check passed. Prism Central console itself doesn't need an additional license. 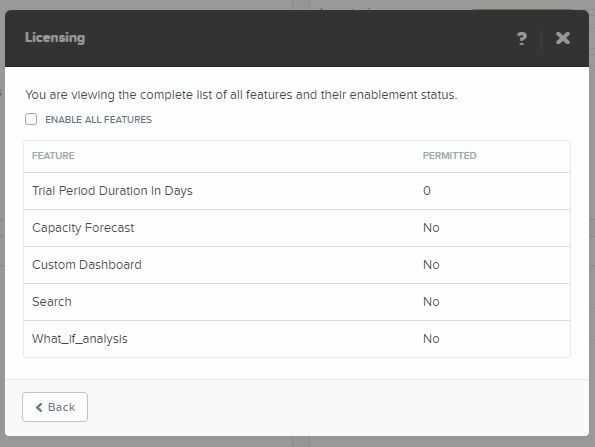 Many features that you can access through this console, including the default home dashboard, the explorer, the analysis, the central configuration of alert, etc, are there without any additional license. In addition to those features, the Prism Central console also allows you to access features included in Prism Pro, a separate product from Acropolis (of which Ultimate edition is what you have) that adds the additional layer of intelligence and automation around operations, driven by X-Fit machine learning technology. The trial license you referred is about the Prism Pro. The features included in this product are one-click planning, dashboard customization, Prism search, etc. For details, please check https://www.nutanix.com/products/software-editions/ and click the "Prism Edition details". Please work with your account team to acquire those licenses. If you choose not to acquire the Prism Pro license, you can continue to use Prism Central console for all the features I mentioned in the first paragraph without any additional license. Can you tell me how to get rid of the 'license violation' alert once the trial license expires? off the top of my head, go into the gear in the right hand corner > licensing > and there should be a few check boxes for Prism Pro features to turn on or off. If you turn those off, license warning will go away. This is the only thing I see and cannot find options to turn off. What version of Prism Central are you on? I dont have a Prism Central in front of me right now, I could have swore that one of those hot links on that page will take you to the feature selection menu. If you have a Prism Central 4.6.2 and later version, you can follow the steps shown in the screen below to disable the Prism Pro features. After that, the violation warning will disappear. The difference with your screenshots is that my license is already set to starter rather than Pro Trial. Well never mind. Found out I had to click on the 'Starter' license to get the screen to disable the options. All sorted now. Thanks. Apologies but I spoke too soon. Although I found the option to disable the extra features, once disabled, I still get the warning about license violations. I already tried restarting prism or all cluster services but without any luck so far. Well that is certainly annoying isn't it? Sorry about that, unchecking that box should have worked. Can you send in a support ticket when you get a chance so we can have an engineer take a look at this for you? I raised a support ticket with Dell (we are using the XC series) and see what happens. Not sure whether they'll forward to Nutanix knowing that in theory we don't have a support contract for Prism Central (starter). It should be supported since you should be able to disable the Prism Pro features particularly as a Prism Starter user. Hey dboden - no worries, if you've got a Dell support contract, that should be good enough to get this investigated. If you encounter any push back, let us know. hey Zentura been crazy busy, following up on old threads tonight, did your error also go away, or do you still have this problem? I need to do the same. Prism central is running in my main cluster and its with trial license. 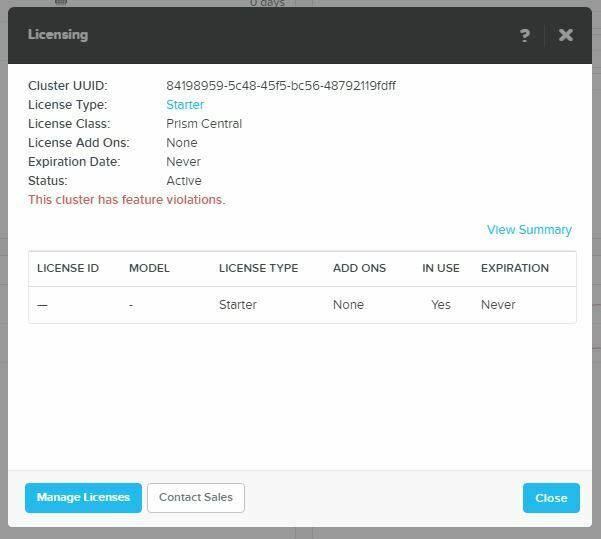 When I click Generate cluster summary it says "This operation will start the licensing process by putting the cluster into standby mode. Once activated, a new license must be applied. Cluster performance or functionality will not be impacted. Do you want to continue?". What means "standby mode"? I am a bit afraid, because I'm experienced with vmware's concept about "stand by mode". So, can I securely click "Yes"? Features not permitted by prism_central_Starter license are being used. 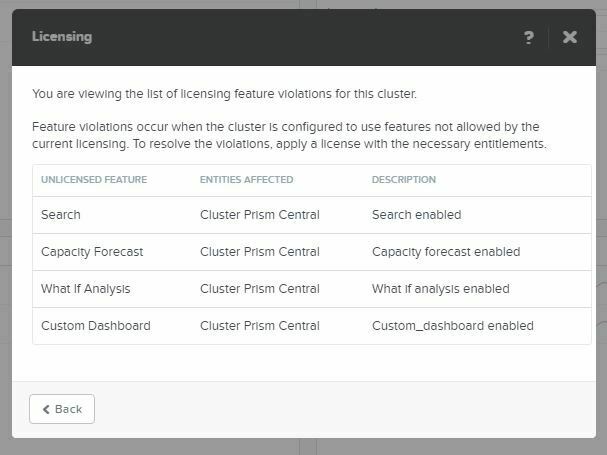 The Licensing pane shows me what the "violations" are - things I have not used yet, so why were they enabled in the first place, and why can Nutanix not just disable the features like VMware does when trial licenses expire. A poor show if you ask me, pass the buck to the user.